What a difference a year makes. 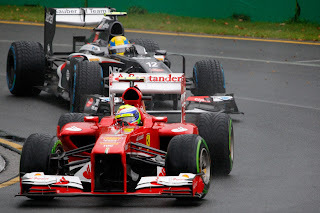 Twelve months ago, after the opening two rounds of the 2012 F1 season Felipe Massa looked to be a dead man walking. He hadn't left much of an impression on the opening round at Melbourne (and indeed didn't make it to the finish), and worse in Malaysia he finished a distant P15, close to a lap down on the winner. Who just so happened to be his team mate. And even worse than that, coming home a close second that day was Ferrari protegee Sergio Perez, having put in what appeared to be a star is born performance. And it all followed a protracted period of struggle for results by Massa in what is just about F1's most demanding team; his previous podium finish was close to 18 months beforehand. His imminent dismissal from the Scuderia looked to have all of the inevitability of Dr Strangelove's doomsday device. And yet 12 months on Massa is not only still on Ferrari's driving staff but is looking a much stronger proposition than he has in some time. Stronger indeed than at any point since his harrowing accident while qualifying for the 2009 Hungarian Grand Prix, which resulted in a fractured skull. Indeed, he's started to give even the exalted Fernando Alonso across the garage a run for his money, having qualified ahead of him in the last four meetings. And you'll struggle to find people unhappy with this state of affairs, given Massa's status as one of the most popular figures in the sport. Like his countryman Rubens Barrichello, even in the hard-bitten and cynical paddock there are few who speak ill of him, and his dignity displayed in the most testing of circumstances in Interlagos in 2008 was a true mark of the man. And perhaps we shouldn't be too surprised at the resurgence. As after all we all knew that there was a very good F1 driver kicking around in there somewhere. His 2008 campaign, wherein he at the end of it was world champion for 30 seconds, confirmed as much. But it cannot be denied that Felipe's trough was an extended one, and the book of suggested reasons for it is well-thumbed. Of course, no one, probably not even Massa himself, knows the exact extend that the aftermath of the head injuries sustained at the Hungaroring diminished his subsequent performances. But further it seems that a major part of Massa's chronic woe was the psychological impact of Alonso taking over things at Ferrari off the track, as well as routing him on it. It would be understandable if this was the case. The bonds between Massa and Ferrari were always close: he has often expressed gratitude to the Scuderia publicly for helping his rise in the sport, and one can recall him talking on the radio after his crushing disappointment of having the 2008 title snatched away of his pride of being part of the Ferrari team. His 2009 accident recovery no doubt cemented this relationship further. And having this blown asunder by the Johnny Come Lately cannot have been easy. What, more broadly, was also no doubt difficult for Felipe to accept was that with Alonso he had to face that there was someone he was struggling to beat. OK, he had that with Michael Schumacher too, but that was different given Schumi was much older, had been there and done it and Massa's relationship with him was transparently that of master and apprentice. He and Alonso instead were contemporaries. And Massa's career progress up until that point had been clear and regular: like many who end up in F1 he had much success in the junior formulae, and then in F1 he made the what looked inexorable upward steps of Ferrari tester, Sauber loanee, Ferrari number two and then to being the guy that could lead a title charge there, even ahead of the expensively-acquired and prodigiously-talented Kimi Raikkonen. To spend years climbing a mountain, believing that you are close to the summit finally, only at that very point to encounter a sheer face that you cannot scale, must be a devastating experience. And nothing succeeds like failure: it meant that he was was quickly thrust into the role of supporting Alonso's title bids, and for all of the role's ubiquity no one jumps into a go kart dreaming of being a 'number two'. And firming up the negative cycle was that Massa, more than just about any contemporary F1 front-runner, seems reliant on confidence in order to perform, and his confidence now appeared shot to pieces. As for Massa's recovery? Well, the book of suggested reasons for that is as well-thumbed as that for reasons for his struggles. His resurgence was actually more gradual last year than is often acknowledged, but in terms of results the difference between pre and post the summer break is striking: 25 points from 11 rounds versus 97 from 9. Part of it can be attributed to Ferrari's general technical improvement: just as the biggest pace gaps between Schumacher and Eddie Irvine could be found in 1996 when the red car was a dog, so it appears to be the case that the biggest gaps between Alonso and Massa could be found in similar circumstances. But mirroring that the overarching reasons for his trough were psychological, it seems that psychology helped him get back into an upturn. Indeed, the man himself attributes his improvement to that: 'It is not that the car changed that much' he said, 'there was also a change from my side...You need to believe in what you can do. I believe in myself, I know I can be champion, I know I can win, I know I can be what I was all my career'. The consensus is that in this ilk Massa, crucially, stopped worrying about how he compared with Alonso and instead shifted his focus onto himself and how to make himself better. I've no idea if Massa sought professional help with psychology at this time, but I'd imagine that if he did then 'you can't control the other guy, you can only control yourself' would have been one of the first things said. Perhaps also being at the point where he had nothing left to lose (indeed, had Ferrari dropped him it is not at all obvious where if anywhere in F1 Massa would have ended up) in a perverse way helped too. Just as a tennis player in that situation facing almost certain defeat in a match often suddenly loosens up and starts to hit winners, Massa seemed to display the freedom of the damned, forgot his burdens built up over time and start to drive to his best. And just as nothing succeeds like failure, success also breeds success, and Massa got into a virtuous circle wherein the confidence of good results helped him to grow yet further. After his second place in Suzuka last year indeed he seemed immediately to grow a few inches taller. So, what of the future for Massa? To a large extent he's providing Ferrari exactly what it wants from a team mate to Fernando Alonso; by luck or by judgement various factors have aligned to make him close to ideal for the role. Massa now appears quick enough to take points off rivals (had he started to do so earlier in 2012 perhaps it would have tilted the drivers' title in Alonso's favour? ), to keep Alonso on his toes, to score points to assist in the constructors' championship charge, as well as well when the circumstances call for it to be used strategically to Alonso's benefit. 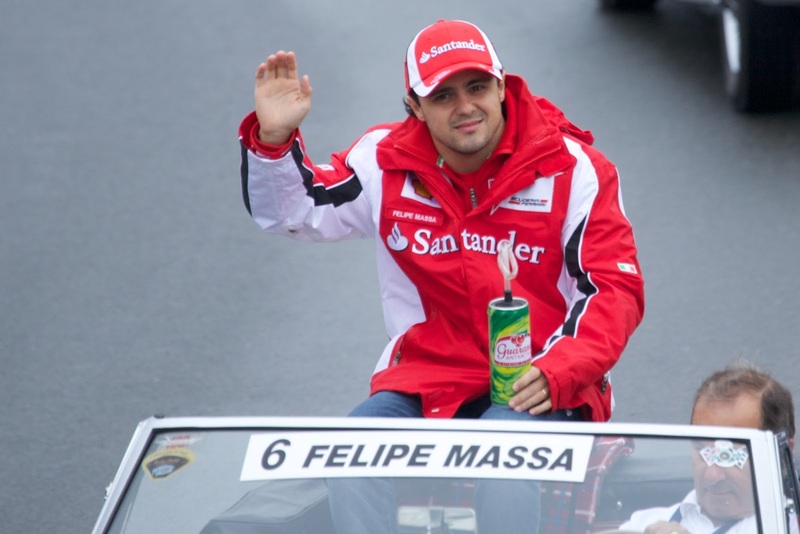 And all the while it appears that ultimately Massa is willing to accept his role too, and to not rock the boat unduly. As Massa himself noted after accepting a grid drop in Austin last year to the end of helping his team mate: 'It's difficult to find a driver like me'; Ferrari finding another driver who ticks all of these incongruous boxes will not be the work of a moment. Indeed as a consequence, good number two drivers often leave the sport as richer men than many number one drivers, to such an extent does demand outstrip supply. And it's difficult to see where the downside is for Ferrari either. Some, with something of a glint in their eye, have predicted intra-team trouble from Massa's improved challenge akin to that which took place with Alonso at McLaren in 2007 (coining the terribly overused 'toys/dummy out of the pram' phrase). I for one cannot see it, however. For one thing, Alonso's feet are much more firmly under the table at Ferrari now than they were at McLaren then. For another Alonso is now six years older and (presumably) wiser. And with no disrespect to Massa, even at his best he's not the formidable foe that Lewis Hamilton was in 2007. Even with Massa's good run of qualifying form, one still suspects that come race day Alonso will usually be the more effective, as a consequence of his relentless pace as well as his ability to think on his feet. That was indeed the case in Melbourne, and you feel that given a trouble-free run in Malaysia he'd have scored a better result than Massa's fifth place, 25 seconds shy of the winner (indeed, you wonder the extent that we'll look back at Malaysia as a missed opportunity by Massa, given it featured what may be a rare drop out for Alonso). And Alonso for all of his virtues has never been a qualifying specialist in the Vettel or Senna mold, while Massa at his best was a very good qualifier himself (he out-qualified Kimi Raikkonen six times in a row in 2008). And there were peculiar circumstances in the last two outqualifying cases. But even with Massa's improvement his position may yet be hardly less precarious than it was before. The much-praised Nico Hulkenberg's move to Sauber this year was thought to be inspired by greater Ferrari proximity, I've heard it said that Mark Webber to Ferrari may yet not be a dead duck (and it now looks unlikely that Webber will be at his current employers in 2014) while Jules Bianchi of Ferrari's young drivers' programme is winning many new friends, performing strongly in the Marussia. 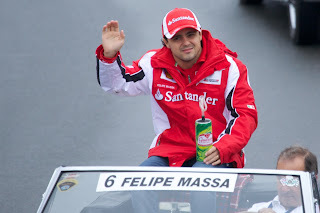 And, let's not forget, Massa is now in year eight of his Ferrari race seat stay. While no team prinicpal gives a driver a pre-set life span like the Tyrell Corporation gives a replicant, the 'time for a change' feeling at the Scuderia may yet become a diverting one. And, as before, it seems to be Ferrari or bust to a large extent for Massa. None of the other top teams has expressed an interest in recruiting him, which would leave the midfield. But even that may not be fruitful, given much of the midfield looks for youth and/or money from its drivers these days (Massa isn't big on either). And with the rule changes that await for next year the gap between the midfield and the front may be much greater next year. It all means that Massa absolutely cannot afford to relent. Whatever the case though, performing well will make everything easier, whether it be retaining his current drive or finding a new one. For the first time in a long time, keep doing what you're doing now is the best advice anyone can give to Felipe Massa. Thanks very much Peter for your kind words, glad you liked the article.